What is the Careers & Employment Expo in Adelaide? Proud to be one of South Australia’s largest careers, training, education and employment events, Careers and Employment Expo is coming to Adelaide in 2018 on the last weekend of May. The expo offers a vast range of career opportunities and information for job seekers of all ages. An abundance of leading organisations across all industries will be gathered during this two-day expo. Students, graduates, early-phase career seekers and mature age career changers are all encouraged to attend the event for guidance, clarity and opportunities in relation to career options. Adelaide Careers & Employment Expo is a complimentary event open to the public. Get your ticket by registering here. This event is a perfect opportunity if you are seeking career information and professional advice for your future development. You will have a clearer mindset in career direction as you walk away from the expo. It allows you to communicate with potential employers or institutions face to face and receive up-to-date information at once. Click here to access the complete list of exhibitors at the Careers and Employment Expo in Adelaide. Did you know our career management programs come with a guarantee? With personalised one-one-one career solutions, we promise to bring you success in your job seeking journey. Contact us now to land your dream job faster. NotedCareers is excited to attend as one of the exhibitors. Please make sure to visit our stand and talk to our principal career managers, who will be answering all your career concerns and offering some career advice. 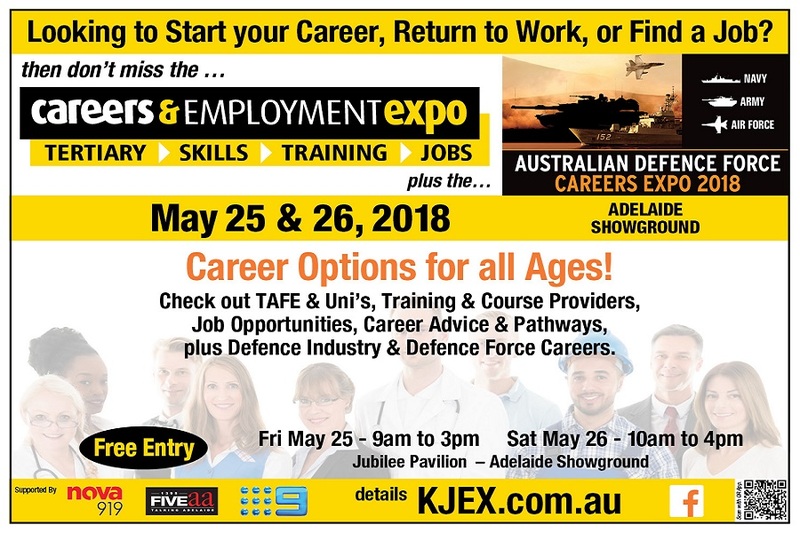 We will also be giving away FREE resume check & career consultation vouchers on the day to all visitor at the Expo on 25 – 26 May 2018 at Adelaide showground. Register below!! !